The same Bedford (i.e., extra-elongating) silhouette you love, now with long-sleeves. You'll love its spongy fabric that retains its structure throughout the day. Oh, did we mention it’s machine washable too? Made in NYC. Slim, long fit that skims your body. Our model in navy and mulberry is 5’9 ½” and wearing a size 2. Our model in black is 5'10" and wearing a size 2. 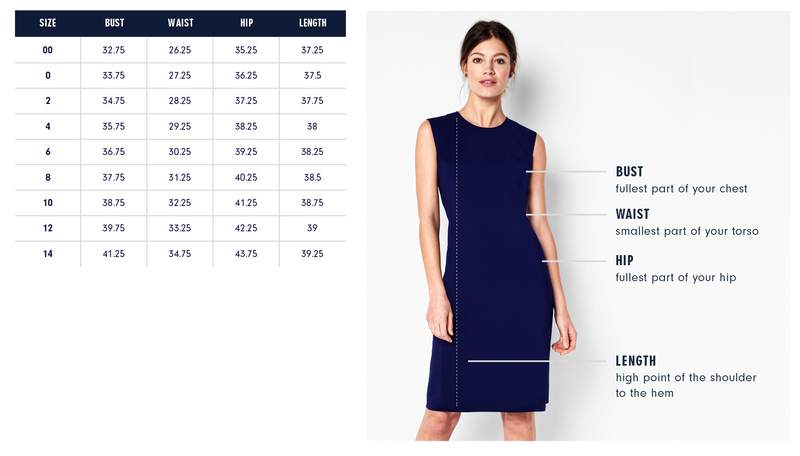 Below are the exact measurements of the Morgan Dress. All measurements are in inches. For general brand fit, sizing, and measurements, please visit our Brand Fit & Size Guide. This fabric’s subtle drape, medium weight and stretch make it super comfortable and durable - perfect for a wardrobe staple. It is the ideal fabric for the clean lines and smooth “hold you in” fit of the Morgan dress.